I’m curating a show for Fringe at Fed Square called Totem: Dolls with Souls through my artistic company, Omnific Assembly. I’m asking artists to create self portrait dolls, not of how they look on the outside but how they feel about themselves on the inside. I’ve had an incredible response, over 110 artists have signed up and are busy creating dolls in their studios and homes all over the world. The dolls are slowly trickling in, and every time I receive one I am blown away by the artistry involved. I feel like a kid on Christmas eve every day, and this’ll continue until we install the dolls in the space at the end of Sept.
Ive curated 6 shows in the past 3 years and I’m always honoured by the artworks that are created. Seeing so many beautiful works based on themes I’ve concocted is always humbling. And thus today’s post. 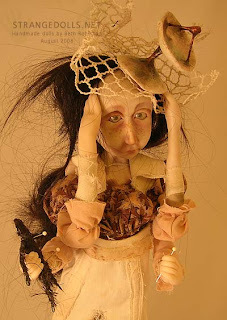 The amazing and talented Beth Robinson, of Strange Dolls fame is one of the artists participating, and this morning she posted her Totem doll on her blog. The doll is an incredible art piece and I cannot express how beautiful it is. I watched with awe the flickr slide show of images of her doll. This is the part of the job I love the most. I ask the artists a question, in this case it’s How do you feel about yourself? And their answers always fascinate me. It’s why I organise shows. I could have made 100 dolls about how I feel inside, but I already know the answer to that, I already know what I’d make and how I’d do it. I’m interested in other people’s answers, what other people have to say, what other artists create. I’d never in a million years have made a doll like Beth’s, or indeed any of the other artists who have and are contributing to the show. And that’s what I love. Standing in the venue on the day everything’s due and seeing for the first time the incredible art every artist has contrubited to the exhbition. Totem: Dolls with Souls is on at the Fracture Galleries in the Atrium at Federation Square from the 22nd of September to the 13th of October as part of the Melbourne Fringe Festival. Totem is part of the Fringe/Fed Square resedency program and opens offically on the 24th of Sept with the other two resedency shows. Opening is from 5:30 – 8:30. So if you’re in Melbourne at the time, come on down and join in the festivities.